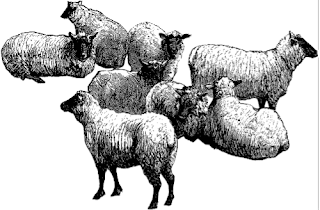 Though sheep raising was never hugely popular locally, in 1865, the largest flock of sheep in eastern Massachusetts was pastured at Lakeville. Owned by Ebenezer W. Peirce of Assonet, the flock was uncharacteristic for both place and time. Though most Middleborough and Lakeville families had owned sheep during the colonial period in order to produce wool for cloth, thereby encouraging the construction of a carding mill in the early 1800s on the Nemasket River, mass produced cloth became much less expensive and the keeping of sheep for their wool was no longer warranted economically. Though Middleborough in 1837 (which then included Lakeville) had as many as 1590 sheep (including 265 Merinos) which, in one shearing, produced about two and a half tons of wool, by 1855, the number of sheep in the combined towns was down to just 579 and it would continue to decline. At the time, it appears that the 359 sheep in Middleborough were being raised for their meat. Contrarily, Lakeville seems to have continued to focus on wool production as it had 220 sheep valued at $660 and producing 600 pounds of wool. Peirce's decision to raise sheep, therefore is somewhat of an anomaly. Later farmers like Ernest S. Pratt at Middleborough would continue to raise sheep, but never again on the scale of mid-19th century Peirce's flock.